Facilitator at the Institute of Director in Southern Africa, Sikkie Kajee, discusses three challenges particularly relevant to South African boardrooms: courage, striking the right balance of power and appointing directors of high quality. * No article or part of an article may be reproduced or transmitted in any form without the prior written permission of the publisher. The information provided and opinions expressed in this publication are provided in good faith but do not necessarily represent the opinions of the publisher or editor. All reasonable efforts have been made to ensure the accuracy of the information contained in this publication. However, neither the publisher nor the editor can be held legally liable in any way for damages of any kind whatsoever arising directly or indirectly from any facts or information provided or omitted in these pages, or from any statements made in or withheld by this publication. In this edition, Audrey Mothupi, Chief Executive officer of SystemicLogic, shares with us her experience moving from the corporate world to more entrepreneurial environs, the importance of embracing disruption and the need for companies to recognise that the digital space is going to grow and advance more rapidly in the future than ever before. Losing weight is not just about the numbers on the scale. Dr Gerhard van Rensburg says we must have one motive, one goal that will be most effective for us to adhere to. He asks what is the one thing we should do repeatedly to build the rhythm and momentum for the change(s) needed to ensure the results we want. Sikkie Kajee, facilitator at the Institute of Directors in Southern Africa highlights common challenges being experienced by the boards of many companies in South Africa, among them striking the right balance of power and appointing directors of quality. The emerging concept of ‘Everything as a Service’ (XaaS) is set to revolutionise IT offerings in South Africa. Implentation of XaaS makes advanced technologies and solutions more cost effective and available to a broader spectrum of business. While concerns around the security of data within servicebased solutions remain, an effectively implemented service model can be in most instances more secure than traditional IT. Organisations simply need to ensure they obtain the right ‘as-a-service’ offering from the right provider and maintain adequate control over their technology portfolio. The most significant benefit of the XaaS model is the fact that it enables businesses to access the most advanced technologies available worldwide. In South and Southern Africa in particular, many businesses fall into the Small to Medium Enterprise (SME) category and are extremely budget-conscious. Obtaining the latest hardware and software in-house, as well as sourcing and retaining the skills required to maintain it is simply not viable for the vast majority of the market. With a service model, however, it is possible to immediately access leading technologies in an affordable manner. Other benefits include greater agility and flexibility as well as a more cost-effective pay-per-use fee structure. Another advantage of the XaaS model in the African context is the fact that it minimises the amount of physical equipment that needs to be secured and maintained. Unfortunately, theft is not uncommon and hardware is often the target. Making use of, a cloudbased technology provider mitigates the risk of securing on-premise hardware and the sensitive data it may contain. In order to mitigate any other security concerns that a business may have, it is essential to engage with a well-known and reputable provider. For example, providers with high profile clients within the financial services industry, means that their services will already be subject to the most stringent security and compliance requirements. Some global cloud providers also offer a sovereign cloud service, which is ringfenced within the borders of specific countries, to meet legislative and compliance requirements. By conducting due diligence to obtain the correct services from a reputable provider, the service model is likely to be far more secure than an in-house solution. Businesses have access to more features and more advanced technologies and can benefit from global best practices. These global providers stake their reputation on delivering secure services, and businesses will benefit from the investment made into security. In addition, a reputable provider will offer welldesigned solutions something which the majority of organisations in Africa simply do not have the skill sets and capabilities to achieve. The XaaS model offers a significant step forward for emerging markets. Obtaining solutions through a service model does not absolve organisations of ultimate responsibility for security. It is up to them to apply a good solution design within their environment, and that the solutions delivered meet their business, security and compliance requirements. In summary, to leverage the full benefit of XaaS, organisations need to do their homework. This includes finding a vendor with a solid track record and experience implementing XaaS. Your chosen vendor should make use of cloud services from leading global providers and be able to tailor a solution to meet your needs, including ensuring security and compliance objectives. It is then essential to monitor these services and solutions. Businesses must maintain responsibility for their data regardless of the delivery mechanism of their IT services and solutions. Water is everywhere, in us and around us, in liquid, solid or gas form. Take a moment and consider how wonderful water truly is! A sparkling lake on a hot summerâ&#x20AC;&#x2122;s day, ice cubes clinking in your glass of cool drink, a hot shower on tired muscles, gentle rain feeding our gardens and refreshing our souls. We rely on water each and every day for our very lives and well being. But, the water we have on Earth is finite and the amount of water that is available for human consumption is actually reducing due to many wasteful or polluting practices. Tips on Saving Water It is surprisingly easy for households to reduce water consumption by between 30% and 60%. Lets work together to look after our water. This can save you money too. Place a bucket in your shower to collect used water to re-use for cleaning or to water the garden. Use micro-irrigation, a more efficient watering system and mulch to retain moisture in flower beds. Take 5min showers and install a water efficient shower head. imperative. This means that Coloured learners in the Western and Northern Cape provinces can now access Fasset’s bursary schemes, apply for grants and be funded on discretionary projects. Resultantly, Western and Northern Cape Province employers also benefit, as they can now fully utilise the grants available to them. Fasset’s #LastingLegacy strategy strives to benefit the sector, the learner and the employer. To get more information about the revised interventions, please visit Fasset’s website on www.fasset.org.za to access more information. when looking to the future, SKILLS are AT THE HEART OF A HEALTHY ECONOMY. Accountants, auditors, financial planners, wealth managers – their skills keep the South African economy ticking over and safeguard its reputation for the benefit of all citizens. Fasset ensures that finance and accounting professionals are trained to anticipate the unexpected; that those responsible for managing corporate finances are fully versed in legislation and governance, and that consultants relied on by South Africans to dispense responsible financial advice have the knowledge and acumen to do so. Fasset is building a lasting legacy to shape South Africa’s financial future. Visit www.fasset.org.za. 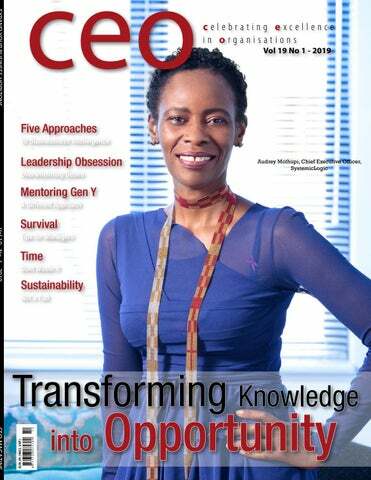 Opportunity In this issue of CEO magazine we speak to Audrey Mothupi, Chief Executive Officer of SystemicLogic, about her entrepreneurial journey, leadership challenges in the SME environment, the self-disruption of business, the evolving digital economy and what the digital future holds for business. honesty in everything we do and a pursuit of excellence are nonnegotiable. I find it drives how we deliver to our clients, and influences how we recruit. The recruitment aspect is important because if you don’t align the people you bring on board to your values and your vision, then you’re not actually going to be true to your delivery requirements, your customer or your client. So at the heart of it, leadership is about providing direction, but more importantly, being the first to anticipate the changes around you from a customer point of view, from a process point of view and from a trade point of view to ensure you are able to compete. Leading an organisation in today’s demanding and ever changing business environment where digital developments are forever creating new business frontiers is challenging. How do you think a business leader can keep their company focused and moving in the right direction? You have been on both sides of the fence. On the one side you came from a highly successful corporate career on the other side you have wrestled with demands of driving an entrepreneurial organisation. What is the key entrepreneurial lesson you learned along the way? A leader’s vision and values are key to keeping a company successful. During the last five years I have constantly stated that my vision is to wake up every day to create jobs and wealth. It is a bold vision but I know that I have been able to turn it into a reality. I have realised that embracing the digital change prevalent in business sectors brings a great number of opportunities because it can remove many boundaries and create customers that don’t reside in your city, region or country. At the same time this digital opportunity forces you to think about competing with companies that are not in your immediate business space and forces you to recognise that non-traditional competitors can also have an impact on your business. You need to have a strong value system in place that will allow you to drive and engage with your team to think differently and out of the box, address challenges and stay on a winning track. I know it sounds counterintuitive but the entrepreneurial environment has taught me about allowing myself to be more vulnerable as a leader. You have to humble yourself in everything you do. You also need to be the first person to acknowledge that there are certain things you can and can’t do. Perhaps most importantly I have learned to willingly admit when I have made mistakes. I use the word ‘vulnerability’ because for me it denotes honesty about myself as a leader and a new level of awareness I did not always possess. In many ways it is about identifying my blind spots and allowing my team around me to grow in a way that fills those open spaces. Of course, the inescapable fact of leadership is that you carry ultimate responsibility and entrepreneurship has reminded me that ultimate accountability always rests with me. I need to stand up and be counted when it matters. world from a corporate environment, you need to reshape your experience, bring it forward and apply it in a different way. As an entrepreneur I learned about the value and importance of dreaming and being curious. If you don’t indulge in this, you are not going to innovate and you won’t be able to challenge your teams and even your clients to think differently. In other words, disrupt what you and your clients are doing? Absolutely. You have to dare to dream and find ways to translate it into action. I define myself as a disruption leader and always stress that disruption is not something that should be defined as negative. I think the challenge is that disruption does not lend itself to a process or discipline and is therefore often seen as negative. In reality disruption means that you are doing things differently, looking beyond your industry at others and questioning how they get things done, and find ways to transcend the challenges that exist in your industry. Disruption and the changes it brings are here to stay. When I speak to young people, software coders who ask me where they should focus, I always suggest they take a look at the world around them, look at what roles they see are being destroyed and try to imagine what the future will look like in that industry. While robotics and artificial intelligence will continue to grow in presence and availability, it does not mean they will replace people. We need to innovate further so that we can find solutions to make sure the human elements so critical to any delivery are maintained. There is also an onus on leaders to look five to ten years into the future and start considering the unintended consequences of some of the decisions that are being taken today and to start implementing processes to manage these consequences. A number of businesses have looked to ‘self-disrupt’ in recent years with limited success. Most recently one of the globe’s largest mining companies have given up on its digital re-invention efforts. Does this mean the transition to a digital business model is not for everyone? We can take the emergence of financial innovation via technology and the emergence of fintech companies as an example. There was a distinct period where the traditional banking sector appeared to be under ‘threat’. The conversations going on in the industry were about how these companies were going to dominate the banking and financial landscape. Things seemed bleak, but then a leadership component started to emerge from within the banking sector that had the vision and nous to realise the emergence of FinTechs presented a great opportunity to resolve some of the bigger challenges the sector faces. When this mind-set shift started, the evolution of technology in the sector began to gather pace and today we have an ecosystem where banks and fintechs are in a symbiotic relationship. The tough reality of disruption for many companies is that changing your organisational DNA is not easy. In many cases this DNA is the biggest inhibitor to effective change. If you couple this with the fact that technology so often allows nontraditional competitors to come into your space and disrupt your business the need for companies to become more agile, or at the very least seek to collaborate with companies who can help stimulate the agility they need, becomes more critical than ever. The challenge is that disruption does not lend it self to a process or discipline and is therefore often seen as negative. Collaborations are therefore a key opportunity to generate and trial disruptive approaches? Partnerships are vital. We can take a look at two examples to illustrate. In the Meditech field we are seeing developments that have an important impact on quality of life and are lifesaving in some instances. In the Agritech sector the potential to maximise physical resources is being exponentially improved through the elimination of the uncertain or unknown. In both these sectors we have seen companies from different fields coming together to create pioneering solutions. If you were to ask me what type of companies can resist disruption I would argue they are businesses servicing very localised markets, which have a strong authenticity in their business and market model. A lot of the ‘self-disruption’ seems to be driven by data and the insights it provides into markets. Do you think data is going to be the critical fulcrum around which business success will be built in the future? Your customer behaviour and data on their behaviour are going to be two key elements in the future. Competitive change in the future is going to be less about what your competitors are up to and more about how your customer is evolving and how you create innovations and technologies that support the customer evolution. Therefore the real challenge for business is to ensure they have enough data - more specifically the right data, that can help serve their customers better. needs. Innovation is a constant that underpins this activity, new products and digital transformation are driven by this process of innovation. Of course, understanding what it is that you are going to do for customers and how you are going to approach it is only part of the picture. At the end of the day we differentiate ourselves through the quality of our people. I don’t recruit for the ‘box’, I recruit to ensure strategic advantage. I recruit for talent and I find people with a ‘can do’ attitude and the natural curiosity that comes with this mindset. We’ve managed to win in the market place because of the quality of our people who have the attitude that there’s nothing too big, too small or impossible. The other aspect which is important to us is the quality of our relationship with our It is about high quality people and speed of execution - these client. It’s not a relationship are non-negotiable because in any other are we are confident where we go in to fix a we can compete. particular problem or build a process or build a miniThe end result is predictably mediocre, which does not enhance mum viable product, finish and then leave within the agreed the view of the sector. timeframes. It is important for SMEs to know exactly what space they are We look to integrate with the client and their business going to target, what their offering is and how they are going to in order to deliver the best possible service that can be exmake money. If you cannot articulate this in a succinct manner, ecuted quickly and efficiently. you are going to struggle to be successful. In essence, it is about high quality people and speed of The last issue in this regard and the one I believe to be the execution – these are non-negotiable because in any other most important, is the creation of digital platforms. This is somearea we are confident we can compete. thing I think SMEs often neglect. It means getting the basics right in terms of website presYou often talk about the amazing journey that you ence and other digital collateral. In today’s world customers can have been on with SystemicLogic during the past literally reach you from anywhere in the world. If you are not five years. There has been tremendous growth ready with your digital platforms you will lose out on the opwith you going as far as the Czech Republic and portunity. Bulgaria to pursue projects. What do you hope the If you look at what Amazon and Alibaba do it is really about next five years will bring? creating platforms that allow entrepreneurs to co-exist. It proI refer to myself as the ‘Chief Hustling Officer’ because I know it is my responsibility to keep the company moving vides them with a space and platform to access customers and forward at all times, driving customer service and innovafor the customer to have a one stop shopping opportunity. There are big opportunities in the digital space that can be tion. leveraged by SMEs and it is important that they look into these But it is also about more than just this aspect. I wake opportunities. up every day to create jobs and that’s a vision that resonates with everyone. When you have that, you have a pasSystemicLogic competes in a space where many of sion. It gives me purpose and helps us live up to our reyour competitors are multi-national organisations. How do you differentiate your offering and place sponsibility to shift not only our communities and our countries, but our continent to the forefront of economic yourself in a position to keep winning business? development. Our business is really about three parts. There is a data I call myself proudly African and as a proud African I component, a digital element and the drive towards innovaknow we have contributed to solving some of the chaltion. In today’s world data is liquid gold. If you have all the information you need about your customer you can crelenges the continent faces. I believe that the next five years will see our contribution grow. ate products in the digital space that are aligned with their and we need to find ways to ensure that financial institutions and top tier organisations work with and make finance available to SMEs. There are many examples where this has worked successfully. However, we need to broaden the base of access. The other area that needs attention is the access to basic business tools for SMEs. It is surprising how often you have very good concepts that are not underpinned by an understanding of the importance of something like cash flow, the potential size of a market and what the competitive landscape in a particular sector looks like. A lot of work also needs to go into developing an SME ecosystem. If three or four SMEs can join forces in an effort to secure new business, they collectively probably have a much better chance of winning the business and delivering the service. Too often, SMEs will look to out-compete each other when they are trying to secure business. The result is that an SME is sometimes awarded business in something that they are not that good at. recent training session I conducted at the IoDSA highlighted a few common issues that seem to be causing boards a lot of problems. During the session, we looked at five companies that had or are still undergoing some turbulence, in order to learn from their experiences. While each one of them obviously had their own specific dynamics and personalities, it became fairly easy to discern some common challenges that the boards of these respective companies faced. I would like to highlight three such challenges in this article because, in my experience, they are particularly relevant to South African boardrooms. Recent boardroom dramas reveal some common issues with which directors need to come to grips. The need for courage The IoDSA has been highlighting the need for corporate leaders to be courageous for some years now. But the notion of what kind of courage directors need to show is more nuanced than one might expect. The obvious requirement is for directors to ask the hard questions, not to be afraid of ruffling feathers and to be prepared to put forward a view that they believe to be in the best long-term interests of the company. Very often, this could mean advocating decisions that make the company money or provide advantage in the short-term but potentially compromise its future. This kind of courage must be exercised within the framework of the collective, and this is not always an easy balance to strike. There is tremendous pressure to go with the group, especially as a divided board is never a good thing for the company. Here’s where the second kind of courage comes in, call it “the courage to be independent”. It comes with none of the drama associated with the courage outlined above. I am talking here about the courage to do your own thinking, to give the company the benefit of your thought processes. This is probably what the overworked phrase “exercising his or her mind” really means. It depends on retaining true intellectual independence, examining the board packs critically, and resisting the temptation to be swept along by the accepted narrative or status quo. Humans are storytellers by nature, and everything we say or do advances a particular story, or view of reality. For a director, the courage to be independent is to remember, at all times, never to surrender to the dominant narrative, be it around the boardroom table or more generally. SA Directors Striking the right balance of power It was clear from the various cases studies that there needs to be a correct power relationship between several of the governance role-players. The first, and this is particularly evident in the public sector, is between shareholder and board. The State, as sole shareholder, often compromises board performance and effectiveness by making appointments based on political considerations rather than skill, experience and probity; some of our parastatals are hamstrung by ineffective boards whose members do not necessarily have the skills to direct and oversee massive enterprises, and who are potentially distracted by political wrangling. In particular, when the shareholder appoints members of the executive team, their loyalties are divided. This overreach by a powerful shareholder can also be a factor in the private sector. Another potential imbalance of power can occur when a Chairman is able to dominate the board, effectively shutting down all voices of dissent. This is a particular challenge when a charismatic, respected company founder takes on the chairmanship late in life. One of the case studies also highlighted the way in which a powerful CEO can unduly influence the board, at least for a time. Indeed, CEO-Board conflict is a hallmark of several of the case studies. Finding the right Chairman is absolutely critical. Appointing directors of the right quality Ultimately, of course, it all comes down to the skills, professional and personal, that directors bring to the table. Establishing what skills a director actually has, and how committed he or she is to ethical action, is something that is hard to ascertain in an interview. This is why the IoDSA is putting so much effort behind independent facilitation of board appraisals and the establishment of a formal designation for directors, the Chartered Director(SA), or CD(SA) designation. By professionalising the boardroom role, the IoDSA is enabling the skills of directors to be evaluated objectively and expertly, as well as providing ways for directors to expand and update their skills through director development and other initiatives. Even more importantly, becoming a CD(SA) would entail formal acceptance of a professional code of ethics and disciplinary code as well as the ability to revoke the designation under certain circumstances. In conclusion, there is no doubt that directors face numerous challenges when it comes doing their jobs. otential imbalance of power can occur when a Chairman is able to dominate the board, effectively shutting down all voices of dissent. Good Morning Africa The Biggest and Brightest Breakfast Show on the African Continent! According to Simon Anholtâ&#x20AC;&#x2122;s 2004 Journal, Place Branding, the hexagon model for managing competitive identity of a country can be done using six natural channels of communication: Tourism, Brands, Policy, Investment, Culture and People. Tourism has played a major part in changing the world’s view of South Africa, with every traveler taking a small part of our country back with them.” view of South Africa, with every traveler taking a small part of our country back with them. This is the same for business tourism. The international perception of South Africa influences business travelers when making their decisions of whether or not they should host their conference, summit or business here. upon us, we need to enhance our beautiful country’s brand and reputation. South Africa needs to be innovative to force the world to pay attention. And creativity will play a very important role in increasing our country’s destination reputation. The role of information is an important element for any industry to continue to exist and perform. In our ambition to offer Bleisure travel - a portmanteau of “business” and “leisure” which refers to “the activity of combining business travel with leisure time”, data will play an important role to attract tourists of tomorrow. With the increasing purchasing power in emerging and developing countries, demographic shifts and growing importance of the mobile and online sphere, South Africa must adapt digitally too, to stay on top of its game. The role that the South Africa National Convention Bureau (SANCB) plays in forming a positive reputation for South Africa as a business destination cannot be overstated. Headed up by Amanda Kotze- Nhlapo, Chief Convention Bureau Officer the SANCB is pivotal in the increased numbers of business events in South Africa. Following the success of Meetings Africa 2019, hosted on 26-28th February in Sandton, SANCB is looking ahead to Africa’s largest trade show, Africa’s Travel Indada which is which saw over 7000 delegates from 80 countries attend last year. Although the two travel and trade shows are different, at their core is their stimulation of business travel to Africa and promoting South Africa as vibrant business destination to the world. Watch This Space As we look ahead to the future, the relevance of travel and tourism is only going to increase. Partnerships within the public and private sector, local and international, continue to be vital as the customer belonging to all stakeholders. Through collaboration, stakeholders can be instrumental in forming a positive reputation for South Africa as a leisure and business destination of choice. Once again showing the positive perception of doing business and attracting business travelers to South Africa. Against the backdrop of the slow growth of the South African economy and the tourism sector as the solution to bringing about economic growth and employment creation, it is for all South Africans locally and abroad to play their part in building a positive image of our country as a travel destination of choice. I look forward to leading a discussion on this topic with senior destination marketers from around the country at the 2019 Brand Summit South Africa, on 6-7 June 2019. Testing teams today are challenged with unstable, fragmented environments due to fast changing business needs, and the majority of testersâ&#x20AC;&#x2122; time is wasted on fixing environmental issues. In order to provide the necessary glitch-free, standardised test environments organisations must invest in dedicated Test Environment Management (TEM). This will result in test environments up and running 24x7 and also ensure the testing team only does testing. est Environment Management (TEM) is the process of controlling, steering and managing test environments within the IT space. Services of TEM include release management, service level management, incident management, knowledge management, environment registration and booking. Today, ineffective management of test environment services coupled with a lack of ownership is leading to a multitude of issues faced by organisations. The challenges On time test environment readiness and around the clock availability are the key challenges faced by organisations today. The test environment needs to be stable, so that testing can be conducted effectively, otherwise the quality of solutions will be negatively affected, leading to monetary loss and lack of customer satisfaction. A successful test environment should be agile, catering on demand to the needs of testers to ensure they can take effective products to market quickly, without compromising on quality. Without adequate ownership of the test environment, and without Service Level Agreements (SLAs) in place, the chances of software problems going unidentified increases. When these bugs make it into the hands of customers, resolution of incidents becomes a major challenge. In addition, if effective processes are not put into place to separate the various levels of testing, inconsistencies and instability may creep into testing. The end result of these challenges is that assets, including hardware and resources, are not optimally utilised, affecting time to market and increasing expenditure. It is essential for organisations to establish best in class test environment management practices at an enterprise level. tinuous improvements and better accountability. Automating test environment activities is the final stage in ensuring effective TEM. Many activities in the test environment lifecycle can be automated, and proven tools are available for auto provisioning, auto deployments and test data management. By automating the provisioning process in the cloud, organisations can easily fulfil ad-hoc environment requests and ensure test environment availability with reduced cost and effort. It is also possible to automate day-to-day activities such as test environment booking, incident management, asset management, knowledge base management and service request fulfilment. Furthermore, automation of design, build, manage and refresh test environments is key to helping organisations manage the test environments effectively. In conclusion, there are many challenges faced by organisations with regard to the test environment. Given the importance of software in today’s organisation, it is essential for organisations to establish best in class test environment management practices at an enterprise level. Implementing resource management, strategic planning, process optimisation and automation will help organisations to improve cost effectiveness of solution deployments, while enhancing quality and customer satisfaction. Investing into dedicated test environment management will realise long-term benefits to the overall IT environment and the organisation as a whole. With the number of high profile data breaches on the rise, users and organisations alike are more concerned than ever before with making sure that the sensitive information they handle remains secure. One of the simplest means of acquiring this information for an attacker, is to enter an organisation with the key to the door itself, userâ&#x20AC;&#x2122;s passwords. uthentication is the process of proving that you are who you claim to be. There are a number of digital methods that we use to prove that someone is indeed who they claim to be, but the most common form by far today is through using a secret piece of information, such as a password. This secret bit of information is intended to be something that only the user knows or has access to. However, all too often users choose something that not only isn’t secret to them, but something common that many other users will end up choosing too. Organisations are responsible for protecting their users’ passwords in motion and at rest. At rest, it is important that the password is hashed using a strong hashing mechanism. Ashley Madison is an interesting case study, because despite their users choosing weak passwords, they had attempted to protect the password with a strong hashing algorithm, bcrypt. It was not until the research group CynoSurePrime discovered a weakness in the way that the developers had stored an alternative version of this password that they were able to crack a significant number of the passwords. In order for organisations to better protect themselves against password attacks, as well as implementing twofactor authentication, a strong password policy needs to be implemented. In addition to research being done around compromises like Ashley Madison, MWR have seen a spate of large breaches that began with a password compromise. The iCloud celebrity breaches rose out of a vulnerability discovered in a mobile API that did not limit the number of login attempts an attacker could make. Accounts that were not protected by strong passwords could be guessed by an attacker by exploiting this vulnerability. The JP Morgan Chase breach is another compromise that was widely reported on, and began with an attack that guessed a single weak password in 2014 (https://securityledger.com/2014/10/hacked_password_ behind_compromise_of_75m_jpmorgan_accounts/). The CPNI and CESG in the U.K. have released a helpful set of guidelines on how organisations and users can better choose passwords (https://www.gov.uk/government/publications/password-policy-simplifying-your-approach). Traditional wisdom has often said that the more complex a password is, the better. This wisdom has slowly been replaced with experience and practicality, as users have struggled to remember highly complex passwords and resorted to using predictable patterns to choose them. These patterns, such as capitilising the first character of the password and adding a digit and special character to the end of the password, make the password much easier to guess for an attacker. Instead, long passphrases are now considered generally more secure and can be easier for a user to remember. The passphrase, “Today I walked my dog” is significantly more secure than “P@$$wORD_1” and easier for users to remember, and organisations should consider choosing length over complexity when they think about password policies. MWR has spent several years conducting research into how to attack the mind-set of users when they choose passwords. Most recently, MWR collaborated with Carnegie Mellon University in the U.S., where it came out on top in a comparison of attacks against user passwords where they competed against another security firm and independent researchers (https://www.usenix.org/system/files/conference/ usenixsecurity15/sec15-paper-ur.pdf). Perhaps the single biggest take away from the breaches that we’ve seen recently, is that users have not learnt from others’ mistakes. We’re still seeing the same, weak, easily guessed passwords being used across accounts on the internet. Furthermore, the second lesson for organisations, is that storing passwords securely makes a significant difference in protecting its users. Storing passwords with a strong algorithm such as bcrypt, goes a long way in protecting users in the event of a compromise. Long passphrases are now considered generally more secure and can be easier for a user to remember. losing firms millions per senior job Would you know a business leader if you saw one? The question gathers urgency at numerous organisations as it becomes increasingly apparent that cases of mistaken identity cost South African businesses hundreds of millions of rands every year. he trouble is a top specialist building a career is often a dead ringer for a high potential manager with the capacity for business leadership. The specialist might then be selected for leadership development, move up the management scale and might rapidly take on a leadership role … for which he or she is totally unsuited. Research by the US executive talent-spotters at Korn Ferry highlights the challenge of differentiating between tomorrow’s leader (a ‘high potential’) and a skilled specialist (a ‘high professional’). They have lots in common, including … 	Intelligence and solid academic qualifications, perhaps backed by communication skills. 	Confidence and a desire to be challenged in their work. 	The ability to make tough decisions and solve complex problems. 	Eagerness to continue learning and add to their skills and qualifications. However, the potential leader is a generalist while the ‘high professional’ has narrow focus on a specific area of expertise. The misidentification challenge is compounded by two related phenomena … an obsession with leadership development (often the overwhelming focus of talent management) and the temptation among specialists to become willing accomplices once they have been misidentified as a leader. meeting the costs of managerial mediocrity. Similar considerations apply in a corporate setting. Whatâ&#x20AC;&#x2122;s to be done? US research has enabled the development of assessment tools and methodologies to assist in correct identification. We see growing demand for these services locally. Another positive is the realisation that top specialists can be just as valuable as leaders. As a result, weâ&#x20AC;&#x2122;re seeing better specialist remuneration â&#x20AC;&#x201C; a small price to pay when the alternative is millions in wasted time and resources. The idea of working at the very top with all the attendant perks can be very compelling. what’sHOTorNOT We share brief perspectives with you on items that we think are worthy of your consideration. Wouldn’t it be great if your smartphone could heal itself from minor scrapes and scratches. Well, apparently that is not an unrealistic expectation anymore. Apparently graphene (a form of carbon sheet) is the answer. Researchers at Columbia University reckon not only has the material got some extraordinary self-healing properties. It also holds potential as a super long lasting battery for devices. The big boys (with apologies to the ladies) like Samsung and SanDisk are already looking into the role the material can play in future devices. Interesting times await. The Century City Conference Centre opened in February to much fanfare and interest. The boys and girls behind this mixed-use R1 – billion development reckon with a total capacity of 1900 in 20 venues and a 125 room hotel, they will be plugging a big gap in the market for conference space. It certainly looks swish enough and as we all know, looks is half the challenge. Andy Warhol Scribbler Apparently the man himself once noted: “Being good in business is the most fascinating kind of art. Making money is art and working is art and good business is the best art.” To celebrate his at times off beat genius, Montblanc is, as part of their Great Characters range, producing an Andy Warhol Special Edition, fine writing instrument. As usual quality comes at a price and you shouldn’t expect anything off beat about the price. Fatbikes By all accounts these are now a hot item in the cycling world. We can’t vouch for the fact that every local racing ace has one. However, we do know that manufacturers like Silverback are betting big on the format. So if you are looking to turnover a pedal or two, this could be a good place to start. It’s that time of year again where key decision makers get together to scrutinise every aspect of their business model. As they prepare to execute on strategies for the next quarter they’ll be looking at how their service delivery models may need to adapt to meet the ever-changing business needs and customer requirements. hile the topic of outsourcing versus insourcing has been the fuel for much debate, it’s time to recognise both methods of IT service provisioning for what they really are: the enabling force that drives business change, growth and development. Both outsourcing and insourcing have their respective benefits, and neither is superior to the other, except to the degree that it helps the business meet strategic goals and business objectives. A change in thinking is necessary Even though we have seen the emergence of bi-modal IT systems where the traditional approach to enterprise technology (one that emphasises efficiency, stability, accuracy and scalability) can coexist with a second approach that focuses on agility, speed and innovation, we’re still nevertheless fixed on thinking that the benefits are to the extent that outsourcing the ‘house-keeping’ component of IT will cut costs and free up resources so that innovation can be addressed in-house. Essentially multi-sourcing can provide an organisation with the freedom to focus on developing new products, applications and solutions, which is undoubtedly important in today’s highly competitive business environment. Being first to market is a significant differentiator, however, that doesn’t mean it’s best to keep this process in-house, as outsourcing the innovation might prove to be a smart move after all. that has been around for a few decades with long-standing systems and policies already in place. By choosing a few key IT professionals to align with business, the rest of the work would be outsourced to a specialist service provider - tasks like managing infrastructure, applications and the like. This will enable the chosen key IT professionals to get on with the business of innovating. Given that technology is changing faster than ever before, the issue of whether to outsource the business transformation aspects of IT delivery becomes more and more relevant. The best justification for outsourcing is that a company might not have the availability of all the skills needed, or they might want to replicate something that has already been done elsewhere and then it becomes simply a matter of finding the right outsourcing partner for the job to take advantage of the many benefits of outsourcing. There is general consensus that the perks of outsourcing can be expressed as a cost-benefit. This is because it’s the outsourcing of a service that is already performed for other customers, which is where the scale and commercial advantage comes in. Companies get to make use of case studies and learn from the mistakes or successes in different usages, and get assistance in determining whether international IT trends have local relevance. There’s also the critical benefit of access to skills, which can be difficult to hire and retain internally. Most importantly, by outsourcing the innovative aspects to a specialist, an organisation can speed up their get-to-market strategies, by looking at automation possibilities for large-scale innovation projects. In the same vein, smaller organisations can handover to outsourcing companies and in the process become more agile and responsive to market needs. In conclusion, regardless of whether an organisation chooses to outsource, insource or multisource, it’s important to bear in mind the goals and objectives of the business. While cost-cutting can be a benefit, it’s critical that this is not the sole deciding factor. Organisations need to choose whichever mode of IT delivery that will help them to deliver a more seamless customer experience once they’ve won that customer over with their first-to-market innovative products and solutions. Remaining competitive in a fast-paced, global marketplace is increasingly challenging for many organisations, and the need for agility with regard to products, services and even underlying IT infrastructure has become apparent. Automate the recovery process from end-to-end. Human error is the major issue with manual interventions, and it can be costly to organisations. Automation effectively removes human error, which is one of the leading causes of data loss. Automating data protection and recovery removes this risk element. The data backup and recovery solution must be integrated across the entire IT environment. Given the complexity of the current data storage landscape, integration of data protection and recovery tools is essential. Without integration, organisations are often faced with multiple toolsets, each with their own reporting, analysis and infrastructure to connect. When it comes to managing complicated environments with multiple tools, the complexity increases exponentially. Integration enables simplicity, providing a single platform for the management of data protection, recovery, compliance, search, eDiscovery and more. The entire environment must be managed via a single platform. This stems from the need for integration and improved simplicity. A single platform will help to create visibility across data whether it resides on mobile, in the cloud, or within an organisationâ&#x20AC;&#x2122;s private data centre. A single toolset and management platform spanning the entire information landscape is essential for enhanced management and visibility. A variety of technologies must be available for moving data off-site. Data is created in a vast variety of different ways today, and information now flows in an omni-directional way both from and to organisations. Organisations no longer have complete control over the migration of information, and IT practitioners need put into place secure processes and technologies to manage this flow by policy and the importance of data before it leaves the organisation. Trusted services and platforms are necessary to handle this migration in a secure manner. The solution must be vendor agnostic. Or as vendor agnostic as possible in todayâ&#x20AC;&#x2122;s world. The reality is that there is no such thing as a completely vendor agnostic solution, however data recovery needs to be able to work with a variety of different storage solutions in order to deliver the necessary levels of agility. The fewer solutions or platforms required to manage data the better. The Africa Competitiveness Report highlights the continent’s solid average growth rate of more than 5 percent over the past 15 years, indicating “impressive economic potential”. According to the Report, which is produced on a biennial basis as a collaboration between the African Development Bank, the Organisation for Economic Co-operation and Development (OECD), the World Bank Group, and the World Economic Forum, “a growing labour force and a large and emerging consumer market hold the promise of significant further growth opportunities”. hese challenges are viewed as opportunities by forwardthinking investors, many of whom are providing crucial services such as the construction of infrastructure to further improve their gains. order to maximise their investments. While the continent offers its fair share of development challenges, these can be turned into lucrative opportunities for businesses that have the means and experience to pursue this type of growth.” She adds that in addition to industries such as mining and construction, technology firms are seeing massive growth in the region as a result of the fact that Africa is leapfrogging older technologies as ICT infrastructure is rolled out in areas where there wasn’t even fixed telephone line capability in the past. “Mobility is key in Africa. Technology is seeing massive uptake among businesses and the growing middle class, but as a result of the fact that many areas across the continent were under-served with traditional ICT infrastructure, Africans have simply moved to the wireless and mobile technologies that allows them access to everything from banking to m-commerce.” Africa remains a continent of extremes, Robinson says, and the business environment reflects that. She explains that doing business in the unique marketplaces of the various African countries requires insight into, and knowledge of, the specific business and cultural norms. “Each country is unique, and offers unique opportunities. However, in order to leverage these, understanding that salutations such as ‘prince’ are important in Nigeria, or that many Ethiopian businesses close on Friday afternoons, is essential. It’s only through knowing their target markets that companies can succeed in Africa. Without a partner that can provide these kinds of insights, businesses will battle to achieve the kinds of results that emerging Africa can provide,” Robinson concludes. Chief Information Officers (CIOs) are under enormous pressure to align IT with business strategy in the face of rapidly evolving and changing technology developments. Technology has a significant impact on business, as it is the foundation of operations, and as such must be available 24x7. In addition, technology enhancements and upgrades are essential for agility and competitiveness in todayâ&#x20AC;&#x2122;s market. Faced with these pressures, CIOs are debating the question of whether to insource or outsource various IT components, or utilise a combination of both models. However, while ensuring the lights stay on and infrastructure is available, CIOs are also tasked with ensuring IT delivers business value. Adopting the right outsourcing strategy, and working with the right outsourcing partner, can free the CIO from these mundane tasks. This will enable them to drive the innovation needed to take IT from a cost centre to an invaluable strategic business enabler. ome of the common challenges faced by CIOâ&#x20AC;&#x2122;s include the need to ensure 24x7 support of all IT infrastructure, as well as finding and maintaining the appropriate technology resources to enable this. Technology is always changing, and as a result ensuring resources have the necessary skills is a difficult and sometimes costly task. In addition, since IT is typically considered to be a support service, shrinking budgets are a reality, and IT needs to be managed within a cost saving structure. Demonstrating value to business, and delivering the latest technologies such as analytics, intelligence and cloud-based services thus also become a challenge. Many of these challenges are not new, and in the past have led many organisations to examine the possibility of outsourcing various IT functions. However, outsourcing is not a magic wand that can be waved over IT, and problems cannot simply be transferred to someone else. This is where many organisations have fallen in their outsourcing strategy â&#x20AC;&#x201C; they have not defined clear boundaries, roles and responsibilities for the outsourcer. This has resulted in the perceived failure of outsourcing, which has lead organisations to once again bring these functions in house, only to re-examine outsourcing a few years down the line. In addition, it is generally not advisable to simply outsource the entire IT function, as this can result in losing control over the IT function. There are advantages and disadvantages to both insourcing and outsourcing, and organisations need to weigh up their own business requirements before adopting a strategy that fits their needs. Generally speaking, business-facing activities, architecture and design should remain in-house, while operations, maintenance and advisory services on new technology can be outsourced. Instead of simply outsourcing the entire IT function, organisations are now looking at collaborative multi-sourcing strategies. When it comes to selecting an appropriate multisourcing strategy, it is essential that this be aligned with the organisational strategy as well as its objectives. If the goal is cost saving, then it would be beneficial to outsource operational and maintenance tasks. If, however, increasing productivity and relevance is key, then the selection of functions to outsource will be very different. The CIO needs to work with management to identify key objectives for outsourcing, to ensure strategy can be aligned with this. Defining clear objectives up front will help to guide the entire process. Without this essential step, there is often a mismatch between expectation and delivery, with the result that outsourcing is perceived to have failed. T is typically considered to be a support service, shrinking budgets are a reality, and IT needs to be managed within a cost saving structure. An outsourcing contract can be modelled in various ways, and may be based on delivery, service levels, innovation or any number of other criteria. However, if objectives are not clearly defined, they will never be seen to have been achieved. CIOs today have access to many different options with regard to outsourcing, and an effective strategy can be highly beneficial from many angles, including cost saving and optimisation of the IT landscape. Aligning business to IT remains a key challenge for the CIO. With the right outsource partner or partners on board, the CIO will have the time they need to focus on delivering technology-lead solutions that enable business growth. By outsourcing day-to-day IT operations, CIOs are empowered to drive new innovations that add value in their business. Genuine Concern for the Environment or Reputation Management? Most CEOs would concede that in the beginning, sustainability was, first and foremost, a marketing issue. Corporations and business in general saw the potential for a competitive advantage by touting green products and environmentally sound policies. This was the haute couture in which corporations would clothe themselves to enhance marketing and improve public perception. oday, however, the trend among top CEOs seems to be one of genuine sustainability pursuits; pursuits that are more than cosmetic. Companies have learned that sustainability can make significant differences in short term and long term value. When a corporation learns that it can achieve growth and return on capital through sustainability, you have their attention. Corporations practising sustainability have seen measurable operational and growth benefits, plus enhanced opportunities in new markets. Another benefit of sustainability policies has been an organic increase in cutting-edge products. A McKinsey Global Survey on sustainability shows that: “their companies’ top reasons for addressing sustainability include improving operational efficiency and lowering costs jumped 14 percentage points, to 33 percent. This concern for costs replaces corporate reputation as the most frequently chosen reason; at 32 percent, reputation, is the second most cited reason” This is good news for the environment! Big corporations are the principal users of the world’s natural resources and to see executive interest shift from reputation and image as a primary driver for sustainability efforts, they are acknowledging sustainability’s impact on lowering costs and increasing efficiency. This paradigm shift bodes well for the future of the planet. Room for Improvement—You Bet! Too many companies have an environmental, social, and governance approach that is disconnected from their core strategy. The fact is the majority of companies operate with a splintered, reactive rather than proactive approach to sustainability. Many initiatives remain geared to confirming a company’s green credentials, satisfying regulatory requirements or dealing with emergencies. The issue of sustainability needs to be recognised for what it is … the future of the planet and by default, the future of business. McKinsey’s research suggests that those companies pursuing a sustainability model are capturing significant value. Companies must wake-up to the inescapable fact that they risk not only their reputation but also their profitability by shunning sustainability in a time of diminishing resources and increased regulation. The free market will punish companies that cannot or will not meet the growing demand for sustainable products and services. McKinsey forecasts reveal a clean technology market with a potential to reach $1.6 trillion by 2020. What sane enterprise wouldn’t want a piece of that action? Obviously the opportunities to practice sustainability vary greatly. An accounts receivable factoring firm cannot make an environmental impact equal to that of a mining company or chemical manufacturer. Sustainability Is Hard There’s no doubt about that. Achieving the full value sustainability has to offer requires considerable effort and that effort must come from the top down. Corporate executives must define the baseline performance and then implement a variety of initiatives to drive improvement. Clearly the best results are achieved by thorough integration of the sustainability mindset throughout the organisation. The rewards of this hard work manifest in 3 key areas: 	Return on Capital Return on capital improvements can be achieved by addressing energy use and waste. Dow Chemical, for example, has invested less than $2 billion since 1994 to improve overall resource efficiencies. To date, the company reports saving of almost $10 billion from reductions in energy use and improved water conservation in its manufacturing processes. This represents a nearly fivefold return! 	Growth Companies that pay close attention to the potential impact of trends in environmental regulations can find opportunities for growth. One example is Waste Management. The company practically reinvented itself as an integrated environmental services firm with the addition of waste reduction and waste to energy conversion services achieving significant growth in market share as a result. Some companies find growth in meeting heretofore unmet needs resulting from sustainability trends and still others may employ a philanthropic approach that opens up markets and growth opportunities in developing nations. 	Risk Risk is the bane of business. Implementing a sustainability model postures a company to avoid potential disruptions arising from climate change; resource scarcity; product and other boycotts, and a host of other risks. Nestlé, for example, initiated a plan in 2009 to promote sustainable cocoa production. The plan has produced 12 million stronger and more productive trees—taught local farmers sustainable and efficient agricultural methods and improved access to health care. With business having so much to gain from implementing sustainable strategies, we are certain to see a marked increase in the adoption of sustainability strategies. The marketplace will punish those who fail to do so. Wholesale globalisation suits no one. While it may look great on paper, especially the numbers, in practice it can be patronising and restrictive. Companies, with their Real Estate and Facilities Management (REFM) providers, need to strike a balance between the best of global and local. They must satisfy this subtle, contrary demand to achieve the economies of scale, process efficiency and quality assurance needed for their businesses to compete and retain customers in today’s dynamic markets. Achieving this is ‘glocalisation’. bvious as it may seem, there’s no point changing the REFM organisation if the business, its organisation and infrastructure won’t support it. For example, plant manufacturers in many global manufacturing firms often have autonomous authority to manage their facilities, which makes it difficult (if not counterproductive or entirely impossible) to globalise maintenance and operations. Some things are too important to a company’s ability to trade, and/or its image and reputation to allow any flex at local level. Safety, Health and Environment (SHE) is an excellent example, particularly in highly regulated industries where lost-time incidents or sloppy production environments have the potential to damage life and shut a business down. There are other things which don’t translate across regions and boundaries. Local legislation and culture often dictate that Human Resources (HR) decisions are best made country by country. One leading technology business, for example, recently “de-globalised” HR processes in Asia on realising its global KPIs could never match local expectations around career movement and progression. A helpful analogy to visualise glocal enablers: The abacus There is no one-size-fits-all glocalisation standard. A helpful analogy to visualise enablers on the global/ local spectrum is the abacus. Companies and their REFM providers must allow people to operate between the extremes of globalisation and local organisation. Key enablers such as process and technology should match and support their movement with an appropriate degree of flex. Process must have a strong, global element There must be a strong, global element to all processes for quality assurance, and to ensure consistency of service delivery and data generation. Having said that, any new process needs significant local sponsorship to be adopted. The degree of process localisation will vary according to type. Johnson Controls Global WorkPlace Solutions (GWS) maintenance processes are predominantly global and 99 percent non-negotiable, else we’d never deliver the technical excellence we promise. We’re acutely aware of this at the same time as knowing that without local buy-in, their implementation will likely fail. So, in a recent series of Kaizen events we gathered managers from three regions to re-design several global processes. Initially, everyone believed their way was best. Discussions revealed there was no best way, and over two days consensus was reached on a new, global way of working. It’s about managing behaviours and embedding a culture of ‘we’ as opposed to ‘me’. HR processes, on the other hand, require much more local variation because they must be compliant as well as culturally relevant. Accounting for difference between mature and emerging markets is a further consideration. Technology will help the global strategist and the local tactician At first thought, technology is simply universal. The Internet of Things connects everything. However, there are very clear inputs, outputs, aims and objectives associated with technology that oscillate between global and local. An easy analogy says technology enables strategy at global level; and tactics – or operational excellence through effective deployment of resources, work order management and asset inventory – at a more local level. A closer look reveals glocal interdependencies for strategists and tacticians:  Global and strategic: The inputs needed to make technology a global enabler hail from local sources. Lease information, occupancy sensors, financial data, asset information – all feed into one platform that enables a portfolio to be viewed transparently, both in its entirety and in granular detail. A typical series of technology queries, show the beads on the abacus move diagonally from global to local, and then back again.  Tactical and local: Another view of technology is as an operational enabler. In this guise it facilitates efficiency on the ground as well as generates visibility from the cloud. There is a cycle, or flow, that starts with a service request at local level calling on global systems and processes to deploy the appropriate resource and ensure a job is done well (by a local person, obviously). Customer satisfaction, cost and asset performance are assessed against global metrics, and reported in like fashion. These views, which could be summarised as ‘global powers the system, local delivers it’ lead neatly to the most important glocal enabler: people. People are the essence of success Physical presence can only ever be local, so mind sets must be global: the key to any business success is to create organisations that embrace and enact shared visions and values. It’s sometimes impossible for the right hand to know what the left is doing, especially in multinational organisations where people can’t always, or rarely meet in person. Strong culture, communication and leadership are essential to ensure that when people act independently, they’re in pursuit of the same goal. Our five key steps to enable a successful glocal organisation can also be viewed as enablers, or change agents, for the people enabler. or brought an innovation to life, they’re likely to want it to succeed. If you bark orders from head office expect them to switch off, especially the bright ones. Sign everyone up to a simple global vision and build a truly glocal team: people working in synergy around the world in pursuit of a common goal. 3. Recruit to the model. Healthy tension in any organisation is good. ‘Yes men’ and people who pay lip service are not. It’s obvious you need to recruit fresh blood to invigorate the system, as well as promote and reward existing employees who model and act the right behaviours. You want to end up with a company that lives and breathes its values – from ethics and integrity, to customer satisfaction and operational excellence. 4. Communicate, communicate and communicate. If you want local teams to adopt your glocal vision you need to communicate it consistently, constantly, clearly. Left alone, things revert to their natural state. This is nowhere truer than of people, their routine and habits. People need to be reminded what’s expected and included in a real dialogue that affirms why. See point two, above: Engage them. 5. Show strong leadership. Alignment in the leadership team is essential. Everyone needs to agree - to a very strong degree - on the glocal model, and become its ambassador. Be diplomatic: show willingness to flex but not to yield. ccounting for difference between mature and emerging markets is a further consideration. In conclusion REFM organisations, much like the companies they serve, have little choice but to embrace globalisation. The key to their success lies in identifying where to allow local variation, as well as include the local organisation in the design, implementation and development of global tools and models. Or, as we call it, the ability to glocalise. People, process and technology are obvious but key glocal enablers, all demanding different degrees of treatment on the global/ local spectrum. The abacus is a useful analogy to visualise where they start, and have to move from and to in order to support a business and its portfolio operations - with transparency and control on the global hand, and service delivery excellence on the local one. Process and technology are nothing without people, however. Only those who can win hearts and minds, communicate consistently, and lead with clarity and purpose will succeed in our increasingly competitive world. As body, mind and spirit, how we take care of our bodies is of no less importance than how we think and how we love. After all, we received only one ‘vehicle’ for our life journey here on earth and that is the body that we feel, and later see in the mirror, when we wake up in the morning. All our great mind and spiritual potential depends to some degree on the good condition of our health. We know it is true that good feelings about our bodies transfer to positive thinking and more healthy attitudes. We are also aware of the fact that, as life presents challenges to our mind and spirit, so it does to our bodies. This is a continuation, and last, article in this series on losing weight as an exercise in personal mastery. o, know why you would want to lose weight; know that it is one strong enough reason to sacrifice what needs to be sacrificed. ou want to send your brain one powerful message for as long as it takes to change what you want to change. This is the ‘push’ factor. reading the number of kilograms. The one goal we choose has to be measurable. Again, simplicity should be the rule. The more thoughts or visions we want to accommodate, the less effective we become. If we think we want to get into this particular pair of jeans one day, we inevitably relax our concentration on the number of kilograms we set as a goal. If we think it would be fantastic to receive a compliment from a particular person and we visualise it as a goal, the same would happen: we get distracted when we get the compliment and tend to relativise the initial goal – a goal we have not yet reached and know will require some more discipline and sacrifice. In my case, I used the body/mass indicator to set my goal. I did not add a ‘by when’ date to my goal. Change-goals are different from task-goals. Change involves unlearning and the growing of new habits. It is a dynamic process that can be different from person to person and situation to situation. Patience is important for change of behaviour or habits. A ‘by when’ date would not add to my motivation and could in fact be demotivating. We don’t want anything to deter us from the one goal we commit to and need to focus on. We have to trust that results will follow in good time. a bit of research and determine and ‘own’, or internalise, the one theory that we will guide us on the way forward. Again, the principle is simplicity in the message we repeatedly give ourselves for as long as it takes to create new behaviours and habits. When we are convinced and understand the theory we need to pursue our goal, we can ‘put it away’ to retrieve as intuitive knowledge about what to do in different situations, such as standing before a buffet at the year-end function. In my case, my wife and I learnt enough to understand Tim Noakes’s science-based eating plan to follow it as a guide and as the one theory for my weight-loss goal. Balance requires that we remain aware of general health and the important role the medical profession plays to help us obtain or maintain it. One Discipline Once we know what the one motive, one goal and one theory are for our goal, what would be the one most effective discipline to adhere to? Simplicity in discipline is the most crucial of all. What is the one thing we should do repeatedly to build the rhythm and momentum for the change(s) needed to ensure the results we want? If you think about it, you will realise that it has to be a feedback or measurement discipline. In my case, I have decided to weigh myself first thing each morning at least until 1 October (making sure that I don’t fall back in the winter months when I have put on the most weight in the past). What we need is a daily (for weight-loss goals I’m sure it has to be daily) moment of truth; a moment that brings everything into perspective again; a moment that reinforces the one motive, one goal and one theory – messages; a moment that automatically triggers learning and corrective messages (Oh yes, I let my guard down yesterday when I ate that piece of cake more out of frustration than anything else); a moment to find balance (life is more than a matter of body weight; I can forgive myself and refocus on how I want to proceed today); a moment to celebrate success; etc. When we have mastered ourselves in order to master the process towards our goals with the principles I have described, we have learnt how we can re-author any storyline we feel we want to change – even collectively in organisations. Other good news is that, as we look back, we recognise many other positive learnings and outcomes: the enjoyment of savouring the moment as we slow down our eating and drinking, taste the food, smell the wine, and appreciate the gift and privilege of having good food, loved ones and good friends to share it with; consciously choosing quantity over quality; the fact that, whilst we might not have a pretty face or great body shape, nothing surpasses the good feeling of taking charge, responsibly taking care of our bodies, and as a result respecting ourselves more. A stay at Sun International’s Sandton business hotel, The Maslow, not only provides you with what you should expect from accommodation for professionals, it promises a look into the future of the corporate world. Creating an environment in which ideas can be both conceptualised and realised, while enjoying: 281 beautifully appointed rooms, an alluring bar, an urban bistro, relaxing lounges, a soothing spa, an auditorium, conference centre, and 12 unparalleled meeting rooms. Complimentary shuttle every 15 minutes to Sandton City and Sandton Gautrain, free Wi-Fi and complimentary business lounge. It’s just one more way you can experience getting all you need, as well as what you want when visiting this state-of-the-art business destination. Discover The Maslow Hotel. Because the mind’s preoccupation relies on the body’s location. • Voted best corporate hotel in SA. • Voted best small conference venue in SA. • Complimentary breakfast, Wi-Fi and transit lounge. • FREE shuttle every 15 minutes, free car park and gym. • Bistro & bar overlooking a tranquil oasis garden. • On-site spa. • Meeting rooms overlooking an oasis garden with a dedicated butler. Political Overdrive If the BRICS group wants to write the rules of global governance, then it must be prepared to play a more political role and map out concrete pathways of cooperation on a range of geopolitical and economic issues, says Rakesh Krishnan Simha in the Russia India Report. banned Google, but this has not impacted Chinese exports or growth. Russia has been quite vocal about charting a more political path for BRICS when Moscow takes over the group’s presidency in April 2015. Russian Deputy Foreign Minister Igor Morgulov says the long-term aim of Russia and its partners is to transform BRICS from a “dialogue forum and tool of coordinating positions on a limited range of issues into a full-fledged mechanism of cooperation in [respect of ] the key issues of global economy and politics”. Everything worth doing requires work. And every worthwhile startup is time-consuming. Although you may be the one to envision its concept, you may lack the required skills to launch every aspect of your new venture and morph it into a robust company. By dividing the work among trusted partners with the necessary skill sets, you will allow yourself to gain insightful ideas off your colleagues and accomplish much more than you could by yourself. ome people, including many investors, think that the ideal start up team has a coder, a salesperson, a designer, and an accountant. The coder builds the site, the salesperson brings in the business, the designer makes things visually appealing to consumers, and the accountant keeps the bills paid and hopefully, the lights on. Even if you are capable of wearing every hat in your company, there is not enough time in the day for you to wear them all at once and get your company off the ground in short order. Trust me, I’ve put this one to the test. So, if you can’t convince someone to come on board and get behind your idea and fill one or more of these roles, what should you do? Outsource and network I don’t know about you, but the idea of outsourcing always sounded expensive and hiring a company to take on one or more roles that I was unable to do myself never seemed within my budget. That said, I’ve tried to keep an open mind and looked into outsourcing anyway. Apparently, there’s a right way and a wrong way, and you can learn from my experience. Outsourcing the Wrong Way Before working on my current software platform, I interviewed several custom web development firms (whom, for obvious reasons, I’ll call “the dudes”) who provided me with quotes that I knew were insanely overpriced. I felt like the housewife in a 1950’s film trying to buy a new car from the salesman who thinks she’s a simple-minded little lady. While I attempted to inform the dudes that I had some coding experience already and understood what was needed to achieve my plan, they wanted to sell me something they’d patch together that I neither wanted nor fit my company’s objective. After interviewing three different firms, only one of whom who asked deep questions about what I was looking to build, I decided that I couldn’t afford to pay the dudes for some “custom” product that they wanted to square-peg-round-hole offer me. Instead, I would need to come up with a better plan to get my platform up and running. I decided that the best way to move forward was to go see an action film and get my mind off of things. Networking as a Means to Outsourcing I enjoy watching film on opening nights even though they usually come with the customary long queue. I struck-up a conversation with a woman in line who pursuaded me to look into local tech start-up events. The next day, I was registered for one. I had attended business mixers years ago, but these new events were much better. The ones of yesteryear were filled with people swapping business cards listing their all important-sounding professional titles, and conversations about big corporate expansion ideas with companies like Allergan, Mattel, and ConAgra Foods. While I met many very nice professionals aligned with great companies in those settings, I really couldn’t relate to them. I didn’t want a fancy corporate job where I’d have a mind-numbing role. I tried it briefly. It was as if my IQ was dropping - like Edward Norton at the beginning of Fight Club. You walk around in a haze, you forget simple things, you leave your keys in the lock, and you start having conversations that you don’t remember. But I digress. Networking events have improved. Today start-up entrepreneurs are more pay-it-forward minded and seem to better understand the idea that helping others will help themselves and their company grow. I’ve attended many networking events recently and met many people just like me who are looking for customers, team members, and mentors. Networking gives entrepreneurs the chance to meet (and interview) others who can’t wait to help them succeed. For example, I recently met the owner of a human resources management company that not only handles payroll for start-ups, but also provides an online portal for employees enabling them to work remotely, log time, receive payroll statements, host benefits explanations, and company policies. I’ve also met people who were willing to give me advice and introduce me to others who could provide me with information and resources. Building my company and adding team members has not been easy. But networking has allowed me to make some great connections and build enduring, mutually beneficial relationships with other entrepreneurs. Relationships can be the catalyst for success because people do business with those they like and trust. The most rewarding part of being an entrepreneur is to serve others as a resource and to help others succeed. “Pleasure in the job puts perfection in the work,” were the profound words of Aristotle – words that ring true for professional photographer Mariska Coetzer, owner of Solo Deo Gloria Photography, which specialises in weddings, but also offers maternity, family, and graduation shoots, and more. Though her passion for the job has never been lacking, the journey has not been an easy one. continuing to use her services as they build their families long after the wedding. The Composition Influence “The influence in my business is God, for, without Him, I would not even have the skill to be able to take photographs. My passion for photography lies in the fact that I see it not as my job but as my hobby, which I get paid for. A journalist wedding photographer once had a bride come to him after a wedding and say to him, “my wedding was such a blur and went by so fast, but thank you for being the witness to my special day so that I can have those memories forever”. My business motto is built on that statement: ‘Allow us to be the witness to your Happily Ever After’. “In saying that, I must also say that my family has played a huge part in not just influencing my photography style but in the success I now have as a photographer – starting with my dad, who has always supported my dreams and never let me give up, and then my husband, mom and sister. Every year, a report is released on the top 10 companies to work for in South Africa. Useful information is to be found there for sure. Companies make themselves attractive places to work for in all sorts of ways, besides the obvious one (that being moolah). Accounting companies boast onsite masseurs, IT companies have ‘chill lounges’, and a pet food supply company allows employees to bring their pets to work. We explore some of the ways that South African companies are stepping outside the office cubicle to incentivise employees. mployers are doing this for several reasons, but the one that stands out is: make it worthwhile and attractive enough to work at your company, and the more likely your employees are to stay. Don’t assume that it is the antisocial person in accounts or the vets who are the keenest to bring their best friend to work. “Over the years, there have been too many pets to mention who have visited us,” says Goedeke. “We have hosted hand-raised kittens, where staff took turns taking them home because they needed to be syringe-fed every few hours, even through the night; a cat that came to work by car every day for two years (and thoroughly loved the ride); and a Jack Russell puppy, Fagan, that was so adored and such a rascal that he inspired a mascot logo, still used today, 10 years later.” Cube Route vet, Frans Pretorius, brings his Jack Russell, Bakkies, or his Great Dane puppy, Sussie, for a visit every few months. Medical equipment consultant, Darren Gomersall, brought his red setter, Jamison, to work daily, throughout his puppyhood, to socialise him and to avoid his bored, destructive tendencies when left alone at home. Brighter Days at Work “Having animals around is guaranteed to brighten the day,” says Goedeke. “There is nothing nicer than whiling away the hours with a purring cat or Jack Russell on your lap having a good snuggle. What’s more, we really can see just what a difference feeding our brands makes. Not everyone gets to experience this in their line of work and it’s inspiring to see glossy coats, shiny eyes and great body condition.” Felines and canines get a well-deserved break at an outdoor garden area, with poop scoops and packets mandatory and the responsibility of their master or mistress. Cube Route employees are regularly visited by Oscar and the JOY Dogs, a group of therapy animals (Old English sheepdogs) sponsored by Cube Route/ Eukanuba-Iams SA. Dog handler, Sue Green, visits care facilities, retailers and offices with her dogs for the express purpose of providing staff with the opportunity to interact with animals during their working hours. employees are measured on market share, sales, service and ‘fixed right first time’ customer satisfaction scores. Each of the four elements accounts for 4%, meaning that employees can earn up to an additional 16% of their monthly salary every month. Employees in our Group parts warehouse are measured on turnover, procurement, distribution and returns,” says Matt Gennrich, general manager: Group Communication, Volkswagen Group South Africa. Absenteeism affects payout in the relevant month. Supervisors and above receive an annual bonus based on the company’s and their personal performance. Out-of-the-Box Incentives Encentivize is an employee rewards, recognition and loyalty platform that utilises behavioural science to create high-performance organisations and manages the rewards for clients. Employees select from an online store and Encentivize facilitates the purchase and distribution of these rewards. “Encentivize believes in offering real rewards instead of a set of benefits that offer lower perceived value. These rewards are funded through true return on investment on improvements in staff behaviour,” says Martin Naude. “This can be combined with a set of internal rewards such as leave, lunch with the CEO, charities or other prizes.” These unique incentives are supplied by third parties, including the following: retail (Woolworths, Makro, Shoprite), transport (Uber, Tiger Wheel), health and wellness (healthspas.co.za), gifts (gifts.co.za), travel and accommodation (flights and cruises), entertainment (movies, dinners), and airtime. RMB Private Bank has been using the programme for the past year. It uses a combination of points, rewards and leader boards to motivate staff and drive behaviour. Harmony Gold is running a programme to drive health and wellness. If miners go for regular check-ups and answer health-related questions, Encentivize sends them airtime as a reward. This programme helps the miners and helps Harmony understand their needs better. Encentivize is rolling out a more extensive programme focused on performance and is improving health and wellness initiatives. Human beings are complex beings (don’t we know it). So, it stands to reason that pay is not the only motivator. Rewards acknowledge good performance – which makes both rand and sense. Survival of the fattest was sometimes seen during the world’s last economic crisis when banks that were “too big to fail” were bailed out. Survival of the fittest is more likely in the next downturn as businesses and state enterprises assure their future by doing more with less. How close are we to such a crisis and what can executives do to protect their careers? Recession may be closer than we think. outh Africa is close to zero growth and many observers believe global crisis is imminent. They identify various triggers – a big Wall Street correction, austerity in Europe leading to social upheaval, negative interest rates taking markets into uncharted territory or a hard landing by the Chinese economy. The end of the commodities Super Cycle has already impacted resources and emerging markets. Anglo American alone is planning to axe 85 000 jobs. Meanwhile, to avoid sovereign debt rerating to junk status, our government is seeking public sector efficiencies and considering the amalgamation of departments (perhaps entire SOEs). Many managers are unprepared for tough times. The 2009 recession was short lived. Effects were most severe among youthful job seekers who found there were simply no vacancies. If another downturn comes it could last longer and managers with a career path stretching back five, 10 or 20 years could find they are in the firing line this time. Mentoring Gen Y Generation Y (Gen Y) comprises those members of society who were born in the 1980s and 1990s. They are the children of the baby-boomers and are at ease in the information society. Because of Gen Y’s views, both socially and professionally, mentoring and coaching have taken on an all-new approach. ccording to Rene Petrin of the Association for Talent Development, Gen Ys, also known as Millennials, comprise 25% of the United States workforce and will account for 50% of the world’s workers by 2020. It is up to organisations receiving the new wave of employees to customise and evaluate their tactics with regard to mentoring and training in order to maintain and grow with the infusion of new blood. In Petrin’s experience, two methods of direct mentoring that have been prominent are group mentoring and situational mentoring. The first, as the name implies, takes place in a group setting where mentees learn from one another as well as the mentor. Millennials view mentoring as something that can occur at any time and any place, and with any person. This generation is more open to advice and guidance. With the second method, a mentee will seek out a mentor as the situation arises. Such a mentoring relationship may end once the situation has been resolved. Coaching can be in person, via Skype, by email, or through any electronic messaging channel. and often seeks out those whom they can learn from when advice is needed, even after hours. The Contrast The analysis made is broad and generalised and does not (as with most cases) apply across the board. The findings and attributes are based on studies, interviews and observations. ▶	Born in the 1960s and 1970s. ▶	Views authority as expert and does not question those in authority. ▶	Does not feel voice or opinion is important. ▶	Lives to work – and works hard. ▶	Generally had a tougher childhood than Gen Y. ▶	Questions why, and needs to know the bigger picture. ▶	Regularly voices opinions. ▶	Works for a purpose. ▶	Works and plays hard. ▶	Is often future-oriented. individualism is the norm, while West and East Africa encourody language is undeniably important. The question is age low individualism. how to sift out the useful information from the sweepSo, in Europe, healthy debate would be encouraged ing generalisations on this complex subject? What we among all members of the group regardless of position actually say remains important. Although many of us state that or status, while, in Africa, this would be frowned upon. In body language represents three-quarters of communication, Europe, silence in a social conversation would be perceived it does not tell the whole story. Perhaps my use of formal lanas ‘socially inadequate’, while it could be perceived as guage rather than slang was as much a detractor in not getting respectful in African countries. that first job as my shyness was. The following table indicates where various countries fall Adrian Furnham maintains that language itself remains in respect of the high–low individualism dimension: more important than body language as a business tool. “Despite the popular claims that 70% of all information is processed by means of nonverbal unconscious channels, the ability to speak African Time Is Not a Myth and interact in the language of your business partner is much A leading copier company ran an advertising campaign more impressive,” says Furnham in Body Language in Business, aimed at businesspeople that declared: “Time is money”. But which he co-authored with Evgeniya Petrova. time means different things to different people, depending Furnham concludes that some languages also seem beton where you are in the world. Business negotiations take time and, culturally speaking, you don’t want to be seen as ter for certain functions. “Hence George III, who purportedly rushing things or as dragging your heels. Time is therefore spoke to his horse in German, his cook in French and his viewed differently across the world. “For some it is flexible, lover in Italian.” The starting point is to choose your words with care, and depending on who High individualism Middle score Low individualism you are addressing and the circumstances! Communicating with a person from another culture can be Portugal, Greece Europe UK, Ireland, Belgium, France, India, potentially hazardous or helpful the Netherlands, Germany, Morocco (depending on how well you have Switzerland, Sweden, Nordone your homework). A busiway, Finland, Spain nessperson communicating with Romania, Slovenia, Sertheir international business partner Eastern Eu- Hungary, Poland, Czech Re- Russia public, Estonia bia, Croatia needs to communicate in a way that rope Morocco West & East Africa, Arab instils trust. “Body language definitely Middle East Israel countries has a role to play here,” says Furnham. & Africa “Given that we form opinions and make judgements in a split … second North Brazil, Guatemala, Ecuador, & USA, Canada that are not only usually accurate but South AmerArgentina Panama, Venezuela, also pervasive and hard to change, ica Columbia, Costa Rica your gestures and body posture can say more about you than your not very fluent local language.” fluctuating and cyclical; others see it as rigid, constant and linear,” says Furnham. Authors Hofstede and Hofstede proposed five useful navigation tools with respect to cultural differences. “In the West, we are always short on time. Deadlines have These are: individualism–collectivism; high and low power to be met, delays are regarded as a sign of either lack of interdistance; femininity and masculinity; strong and weak est or abilities, both of which are good enough reasons to uncertainty avoidance; and long- or short-term orientation. turn the business down. However, Southern Europe such as These dimensions enable a snapshot view into the values Spain, Italy and Portugal, and their former colonies in Africa and drives of a particular society. Once you know where a and South America, have kept a different sense of time. It is country stands on these dimensions, you can deal with the stretchable, non-pressurising, and adjustable to the needs of members of the culture more successfully, anticipate their individuals. As such, decision making takes longer.” expectations, and adjust your verbal and nonverbal behavSo, in some cases, no news may indeed be good news. All iour in a timely and appropriate manner. In many countries, your business partners are doing is making up their minds. It’s All in a Handshake? Many of us have mistakenly believed ‘strong character, firm handshake’ and ‘overly strong handshake, proceed with caution’. But the way you shake hands depends on your culture. Guy Macleod in his book, Cultural Considerations in South African Business, says that the Western-style handshake is widely accepted, subject to certain conditions. “Greet the most senior or important person in the group first. Ensure that your grip is loose and soft rather than tight.” Exceptions are found in some African countries, for example the Ivory Coast and Kenya, where firm handshakes are made, says Macleod. In Arab countries like the United Arab Emirates, Yemen, Jordan, Saudi Arabia, Egypt, Algeria and Morocco, extremely soft (almost limp) handshakes are customary. Speaking frankly: Adrian Furnham, Professor of Psychology at University College London, is a sought after speaker who has written 57 books. The thumbs-up sign is another gesture with different meanings from one culture to another. Gayle Cotton, in Say Anything to Anyone Anywhere: 5 Keys to Successful Cross Cultural Communication, recommends looking at some of the major differences in body language between cultures before travelling. When you want to show someone your approval, you can confidently make the thumbs-up gesture in the United States, the UK, Egypt, Israel, Iraq, Denmark and Australia. These cultures interpret it to mean agreement and positive affirmation. In Germany, Greece, Hungary, mainland Italy and China, you may not convey the same sentiment, but you’re unlikely to offend anyone. However, in Iran, Greece and Sardinia, the thumbs-up sign is comparable to giving the middle finger in the United States. People in many areas of South America A businessperson communicating with their interna- and West Africa interpret this tional business partner needs to communicate in a way gesture to essentially mean, “Up yours!”. You want to create that instils trust. a favourable impression – you don’t want to wind someone up! countries, a person’s head is considered sacred. Same-gender cheek kissing is customary practice. “As a rule of thumb (no pun intended! ), it is best to avoid using any single finger as a gesture, unless you are absolutely Arabs will sometimes touch your shoulder, arm, hand or sure it is appropriate for a particular culture or country. Openknee during conversation, but never your head. Arabs indihanded gestures, with all fingers generally together, [are] cate disagreement or disapproval by raising their eyebrows or usually considered the safest,” says Cotton. With all these tips moving their head backwards. Residents in Saudi Arabia shake their head to say ‘Yes’. Don’t ask for directions unless you know at your fingertips (quite literally), you should hopefully be on the gestures in the country you are visiting! your way to winning people over. Strong leadership skills are widely acknowledged as vital tools in providing companies with a competitive edge in todayâ&#x20AC;&#x2122;s business environment. he role of leadership, by definition, means that the weight of decisions falls onto your shoulders. Should your business purchase more stock despite a downturn in demand? Can you really afford to send your daughter on that school trip? Should you be making that particular amendment to this specific charter? The art of decision-making doesn’t have to be a continuous cycle of “what ifs”; when it comes down to the core of any matter, there are three questions that need to be answered before you can identify the wisest course of action:  What should start?  What should continue?  What should stop? The quality of your decisions as a leader is predicated by the quality of your diagnosis. The answers to these questions are what you need to put your time and effort into defining. Let’s use a small sales team as an example. The leader notices that the performance of the sales team is down, so she immediately schedules a team-building event and hires a motivational speaker, and then spends money on good food and a great DJ. The result? Everyone is happier than they were a day before, but the reality is that a lack of motivation wasn’t the true cause of the issue. Even though the short term morale will be significantly better, the problem of poor performance will probably not be solved. While some people in the sales team may need motivation, team building could work for them, while others may lack resources, or the knowledge or skill to perform at an optimum level. Some may be falling foul of a flawed sales process that has been systematically breaking down productivity over many years. From this example, we can see that, before making any decision, the first question should not be “what do we do?” but rather “what do we know?” In order to accurately define the problem and, therefore, the solutions, the leader must ask questions about the past, the present and the future. This may seem like an unnecessary effort, but without a good understanding of every lever, the quality of the decision will be compromised. Think about something as simplistic as going through a menu at a restaurant; the people who are clear about what they value and what their lifestyle goals are don’t spend much time looking at the menu because they have already made clear decisions and formulated values that dictate what they will or won’t allow into their bodies. For a leader who is making decisions on behalf of a big organisation, or on behalf of the shareholders who he is accountable to, or on behalf of a country that he serves (having a comprehensive decisionmaking framework is non-negotiable). Even in times of uncertainty, great leaders have to be decisive. By using the tools outlined above, they can become strong and resolute leaders by really delving into the heart of any issue, then using their own personal vision and values to lead them to the right path. Customer service the new strategic differentiator Consumers have never been smarter than they are today. They have more information to help them make purchasing decisions than ever before and they have become accustomed to, and expect, regular interaction with companies. echnology has enabled people to connect with the world and this has shifted the power base from the companies to customers,” says Natalie Maroun, Managing Director of the LRMG Management Group. “In the past if customers had a bad experience their ability to ‘tell-it-forward’ was only as powerful as the amount of people they knew. Today social media platforms create an environment for people to talk anywhere, anytime. “Even if your company has the greatest PR and marketing, these still only put forward the brand promise. The real moment of truth lies in how customers experience your brand promise and how they talk-it- forward,” Maroun explains. Companies world-wide are beginning to understand the changes in consumer behaviour. Customer service interactions are increasingly seen as opportunities for engaging more with customers to gain better customer insights and leverage service propositions for revenue growth. Maroun says that even in an emerging market like South Africa, companies are starting to make this shift. “The SA companies we work with are starting to see customer service not only as important enough to need a defined strategy, they are also mobilising their organisations around these strategies. should not cut out human interaction completely. There still needs be a high ‘touch’ element in order to connect with the customer,” says Maroun. Integrate customer touch points This leads to the issue of touch points in the value chain. Companies need to take advantage of every point of customer contact and, in order to maximise the value of every interaction, distinct silos of customer touch points need to be abolished. “The biggest frustration for customers is inconsistencies between departments. Customers are not interested in how organisations are run, they are interested in their experience. The ahead-of-the-game players are the businesses who are integrating the management of all contact channels”. Drive customer-centricity Customer service relies on one of the largest untapped resources companies have – customer feedback and proprietary customer data, says Maroun. “Customer data is the key to everything however organisations often have so much data that it becomes difficult to discern what is important and what is not. “Organisations need to realise it is not about the amount of data, but the critical and specific data that tells them about their customers’ experience. The survey rhythm often gets it wrong because it gives no feedback to the customer. Feedback is part of harmonising the value chain, the customer needs to feel heard and to do that there needs to be some form of response or action taken following a survey.” Another recommendation from Maroun is to employ or empower a strong chief service officer—someone with advanced strategic capabilities who works closely with peers in marketing, sales, and technology. “These executives can establish a cross-functional, end-to-end perspective on customer processes playing a central coordinating role as the ‘voice of the customer’,” she adds. Mastering the basics of customer service remains the key for customer service organisations that are struggling with poor service and inefficient processes. The challenge lies in putting these changes in place while simultaneously maintaining activities that will truly create value for the organisation, Maroun points out. “Performance is no longer measured solely by cost-toserve. Companies need to ask whether their operation and value chain represent the sentiment of their business. And of course none of this is possible or practical unless customer service is an integral part of an organisation’s value chain,” she concludes. 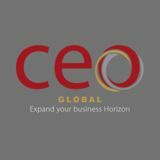 A global survey of more than 1 300 CEOs revealed that the availability of key skills is the second-biggest threat to business growth, close behind the increasing tax burden. A report issued in Business Day showed that this comes as South Africaâ&#x20AC;&#x2122;s government cuts mandatory grants, or reimbursements, that are paid back to companies that engage in sector education and training from 50 percent of the one percent payroll levy, to 20 percent. With this pressure, the question arises; should we be investing in skills development and management training? ahatma Ghandi is quoted as saying; “Man often becomes what he believes himself to be. If I keep on saying to myself that I cannot do a certain thing, it is possible that I may end by really becoming incapable of doing it. On the contrary, if I have the belief that I can do it, I shall surely acquire the capacity to do it even if I may not have it at the beginning.” When people realise their own potential, and the potential of the employees they manage, real growth begins to take place. Through skills development and management training, a company’s performance is exponentially and holistically enhanced. According to Jack Welch; “An organisation’s ability to learn, and translate that learning into action rapidly, is the ultimate competitive advantage.” Experience has shown that through effective skills development, employee commitment and responsibility are promoted. Each individual’s confidence, morale and motivation increases as managers become more skilled in reducing work environment demotivators, and people management efficiency improves. In addition to building the organisation’s overall performance, staff turnover usually reduces and the working environment is made more productive, efficient and effective. All while communication channels are improved between all levels in the organisation, a commitment to quality all round, and the desired organisation culture emerges. Unfortunately for many workplaces, this ideology remains a myth, enshrined in the pages of a management textbook, merely to inspire and create hope. An organisation’s ability to learn, and translate that learning into action rapidly, is the ultimate competitive advantage. However, in skilling the workforce and reducing staff turnover, the knowledge base grows and an institutional memory is created, enabling it to make better, more strategic decisions, and achieve a greater understanding of the company’s objectives. By engaging in new and innovative people management strategies, companies often enjoy improved financial efficiencies, empowering them to compete successfully in a rocky, constantly changing economy. The challenge to employ and develop highly skilled people, proficient managers, foster high performance and create healthy margins is constantly rising and for businesses to not only survive, but also compete in even the toughest of economies, this ideology will have to become their reality. While this may be tough love in the midst of turmoil; in all development initiatives, it is essential to remember that we are ultimately skilling the Nation for the Nation; that which benefits the organisation also benefits the country and the economy. ased in Ashanti Ghana, Fabulous Ladies belongs to Forson Habiba Attah, Chief Executive Officer, Fabulous Ladies FC, who was recognised as a Continental Lifetime Achiever at the 2014 Africa’s Most Influential Women in Business and Government Awards. She humbly says that she ‘gave birth’ to the best Ladies Football Club in Ghana in 1985 when the team was known as Ashtown Ladies FC. “I had held the national high-jump record for 10 years when I introduced national women’s competitive soccer in my country. I was the first lady to win four gold medals during the National Day Games as far back as 1964,” Attah says of her achievements. Today, she singlehandedly plans, funds, executes, monitors, evaluates and supervises all activities of the best women’s football club in Ghana, whose sights are set on conquering the continental scene. Such is the formidable work of an individual who professes to hold a Diploma in Physical Education, testimony that her destiny lay in ensuring that women, and the greater community, are physically fit. In the football fraternity, if anyone mentions the Black Stars of Ghana, this immediately conjures up images of a formidable (men’s) soccer team that has ‘forever’ been difficult to beat and which most recently settled for the silver medal at the 2015 Africa Cup of Nations tournament held in Equatorial Guinea. Even then, they gave Cote d’Ivoire a run for their money, with the latter winning on a penalty shootout. In women’s soccer circles, the name ‘Fabulous Ladies Football Club’ strikes fear into their opponents knowing that they have at least 11 players in the Ghanaian women’s national soccer team. Incidentally, a side has 11 players in the field! r Gullet’s early years were shaped by his adoptive father, who played a major role in his future aspirations. He completed his schooling at Buxton Primary School and later went on to attend Mombasa Technical. He joined the KRCS as a medical officer in 1985 and rose through the ranks to his current position. Leading the Cause Dr Abbas Gullet is secretary general of the Kenya Red Cross Society (KRCS), a humanitarian relief organisation whose core aspects are: emergency operations, disaster management programmes, health and social services, water and sanitation, organisational development, and global fund management. Dr Gullet manages 800 staff and 70 000 volunteers, and, in 2014, he was the Titans Building Nations Continental Lifetime Achievement Award winner in the Welfare and Civil Society sector. Helping others grow and developing the talent of those around him are priorities for Dr Gullet. He interprets these priorities to mean the ability to let people of different backgrounds believe in the same values and be given an opportunity to use their expertise to deliver high-quality services. For him, the growth of individuals is enhanced by management that has recognised their talents and builds on these talents. Talent development, according to Dr Gullet, is shaped when there is strength in management that is evidenced by allowing individual employees room to make decisions. His key drivers in respect of talent development are to reinforce the shared values, to promote a culture of learning, to invest in education, and to view challenges as opportunities. Being in the people business, one must learn to recognise and enhance the skills and abilities of the people around you, a skill that the secretary general has acquired in good measure. in place a new accounting policy and performance appraisal system. With donor funds declining, we went against all known norms by investing in commercial ventures whose proceeds could be ploughed back into the work of the Kenya Red Cross Society (KRCS), which is now valued at USD60 million. Under my leadership, the KRCS started the Emergency Medical Service Ambulances and the Boma Group of Hotels, employing over 700 people. Through such risk-taking investments, I have seen the KRCS recognised by the government and partners, and also awarded Super Brand Status.” Dr Gullet’s work is proof that where there is a vision and a will, there is a way. Other Achievements In 2007, Dr Gullet was recognised as the United Nations Person of the Year, and was awarded the Order of the Golden Warrior by the Kenya Government in 2008. He holds an East African Certificate of Education and a Postgraduate Diploma (MBA) in Practising Management. He was also awarded the Utetezi Award (Civil Society) in recognition of his remarkable contribution to humanitarian activities, and he received an honorary Doctorate of Humane Letters by Egerton University for contributing to humanitarian work. GE has launched a Skills Paper that identifies a three-pronged strategy to develop the skills South Africa needs. These are a stronger education system with closer links to industry, more open and flexible labour markets and a broader talent localisation strategy pursued in partnership with global companies, and the pipeline of skills needed to leverage the technological advances of tomorrow. 37%. With the South African Government’s National Development Plan seeking to eliminate poverty and reduce inequality by 2030, the country is relying on the public sector, the private sector and partnerships between both to support inclusive growth, which is best achieved with a skilled workforce. The research conducted by GE shows that, beyond youth skills development and skills development in the transportation sector, the healthcare and energy sectors are key areas in need of a skills boost. For this, and other areas, GE has invested R500 million in a Customer Innovation Centre in South Africa that will be a centre of excellence for innovation and technology transfer as GE localises solutions for the African continent. Susan Peters, Senior Vice President, Human Resources, said “GE’s commitment to education permeates every part of the business. Globally, GE focusses on bridging the skills gap found in every market. Research, such as the Skills Paper, allows us to identify the most effective way to address the skills shortage across a range of countries, including South Africa. Working together with government, GE can help combat this critical issue.” One of the strategic objectives of the company is working to transform and empower leaders. GE has an extensive programme to develop employees in South Africa and abroad to ensure that their skills are kept relevant throughout their career. A variety of internship and onthe-job training programmes, such as the Financial Management Programme, the Communications Leadership Development Programme, the Edison Engineering Development Programme, and the Early Career Development Program (ECDP) among many others ensure that employees never stop learning at GE. Improving the state of South African education is a priority for the government, the private sector and the public at large. GE remains committed to working with government to deliver skills development programmes at all levels that will help build local suppliers and industry. According to the GE Skills Paper, the youth account for 55% of South Africa’s working-age population. However, this segment of the work force faces additional obstacles to find employment. How many employees are there in your organisation? Over 50, but it varies depending on the day of the week these days, as we are expanding so rapidly. What does a typical workday entail? Arrive at work by 07:30 after the school run. Start with coffee and newspapers/sites to get up to speed on whatever is happening before hitting the desk properly at around 08:15. The day is typically comprised of strategic-level meetings and interventions, with occasional involvement in creative projects and operational issues. The day typically ends around 18:30, and then it’s the 40-minute commute home. seasoned industry veteran and entrepreneur, James Burton, Chief Executive Officer of Hero, successfully avoided a desk job for eight years. In 1989, he took a copy test and landed a position as a copywriter alongside art director, Doug Lockhart, at one of South Africa’s biggest agencies. Within six months, the duo had won the agency’s nationwide internal award for creative excellence. It was then that James Burton decided that ‘one day’ he would run his own agency. In 1996, he achieved that goal and now heads up a small agency called Hero. What occupies your time outside work? Mountain biking (have just returned from the British Columbia sevenday race), surfing, DIY, modifying my soon to be well-utilised off-road motorbike, books. Favourite food? Sushi; rare steak and fries. What was your dream job as a child? Pilot. What would you be if you weren’t in your current position? Pilot! What three things would you take to a deserted island? My wife; 64 GB iPad mini (properly loaded with e-books, TV series and music); and my surfboard (actually, all five of them if they counted as a single item!). What are you reading? Just finished The Watchman’s Rattle - a Radical New Theory of Collapse by Rebecca Costa. On my iPad and next to my bed: Haruki Murakami: The Windup Bird Chronicles and a whole bunch of others that I am reading concurrently, from science fiction to WW2 history. Five people you’d invite to dinner? Sir Richard Branson, Julius Malema, David Bowie, Helen Mirren, Herman Mashaba, and Emily Blunt. What can’t you live without? My children. And the sea. What’s your pet peeve? The seemingly inexhaustible capacity of humans for violence and bigotry and the belief that their own path is superior to those of other religions, creeds and cultures. Three words to describe your leadership style? Quiet. Fierce. Supportive. What led you to your current career path? Chance. And the thought that here was something that could keep me engaged. What advice would you give to someone aspiring to your position? Surround yourself with brilliant people. Seek advice and guidance from someone like me! What do you know for sure? The more I know, the more I know I don’t know! WE DON’T JUST SEE YOU AS A BUSINESS. Minimum Benefits on all Plans. as we know this is the first step to good health. Bankmed Medical Scheme. Registration number 1279. Administered by Discovery Health (Pty) Ltd, registration number 1997/013480/07, an authorised financial services provider.